Bofex is a distributor and retailer in consumer electronics. Under the brandname â€žBig Bangâ€œ it grew within 3 years from a small retailer business to the single largest consumer electronics business in Slovenia with a market share of approx. 30%. Revenues grew from € 5 million in 1995 to approx. 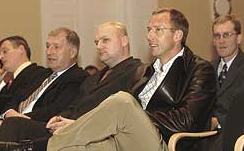 € 28 million in 1998. At the time of the exit the company had 100 employees. At the beginning of 1999 an exit through a trade sale with a multiple of 4.7 and an IRR of 56% p.a. was achieved. Keko Varicon produces and distributes passive ceramic electronic protective components used in second level overvoltage protection. The telecom industry (Ericsson, Alcatel) and the automotive industry (Daimler-Chrysler, BMW, VW-Audi group, Hella, Bosch) are the main customers of the company. During Horizonte’s shareholding revenues increased by 342%. Keko`s manager, Mr. Zivic, was awarded the Golden Gazelle 2004 award for the fastest growing technology company in Slovenia. In 2007 an exit through a trade sale with a multiple of 4.2 and an IRR of 21% p.a. was achieved. A residential building with 20 high-standard apartments with project costs of in total € 2.5 million was erected in the prestigious Kosevo region of Sarajevo. In 2007 the company was sold in a trade sale with a multiple of 1.7. FCL is one of two cement plants in Bosnia-Herzegovina. During the privatization process in 2001 Horizonte supported the Austrian company Asamer & Hufnagl to take over a 51% share and to organize loans from a banking consortium including IFC for the modernization of the plant. The privatization of FCL has been the largest in Bosnia so far (volume € 18 million). Today the plant works at full capacity and is highly profitable. Through an investment program of € 70 million the plant capacity has subsequently been increased to 600.000 tons per year. Today the company is the market leader in the region and has sales of about € 26 million. In December 2005 the shares were sold in a trade sale with a multiple of 1.9 and an IRR of 26% p.a. MKT PRINT Printing and Binding House is a company with more than 80 years of tradition in printing and binding hard and soft covered books. For more than 40 years the products and services have been present on the markets of Western Europe, where it realises more than 80% of its revenues and cooperates with the most eminent publishers. After a drastic turn around process controlled and monitored by Horizonte MKT became a modern, top efficient and profitable company employing about 250 people with revenues of € 20 million. Horizonte exited in 2005 via a trade sale with a multiple of 2.4. Gazelles are companies which start up being small – yet, they grow very quickly and in that respect create the majority of new jobs. Elephants are large companies who on the average are losing jobs. Thus, to a large extent the ability of an individual economy to grow and create employment is dependent on its ability to foster gazelles. Vienna – KOMPTECH, waste treatment specialist, won this year’s export prize of the Austrian Federal Economic Chamber. The company currently exports 95% of its products and services. The price has been awarded to KOMPTECH on Wednesday evening by the minister of economic affairs Martin Bartenstein and the president of the Austrian Federal Economic Chamber Christoph Leitl. The Manager of the Year award has been given to outstanding entrepreneurs by the Slovene business magazine PODJETNIK (Enterpreneur) since 1992 and is such the oldest entrepreneurial award in Slovenia. The Golden Gazelle award is given to the fastest growing company in Slovenia by Gazela R.E., a leading Slovene publisher of business magazines. The Golden Gazelle award is given to the fastest growing company in Slovenia by Gazela R.E., a leading Slovene publisher of business magazines. Bofex has now already won the “Golden Gazelle” award twice: in 1997 and 2002.